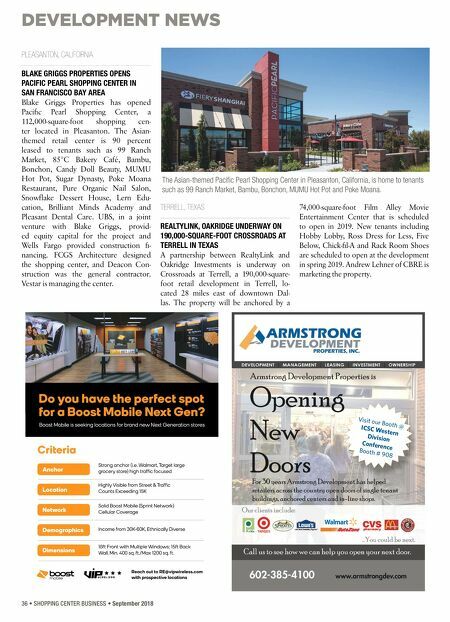 DEVELOPMENT NEWS 36 • SHOPPING CENTER BUSINESS • September 2018 PLEASANTON, CALIFORNIA BLAKE GRIGGS PROPERTIES OPENS PACIFIC PEARL SHOPPING CENTER IN SAN FRANCISCO BAY AREA Blake Griggs Properties has opened Pacific Pearl Shopping Center, a 112,000-square-foot shopping cen- ter located in Pleasanton. 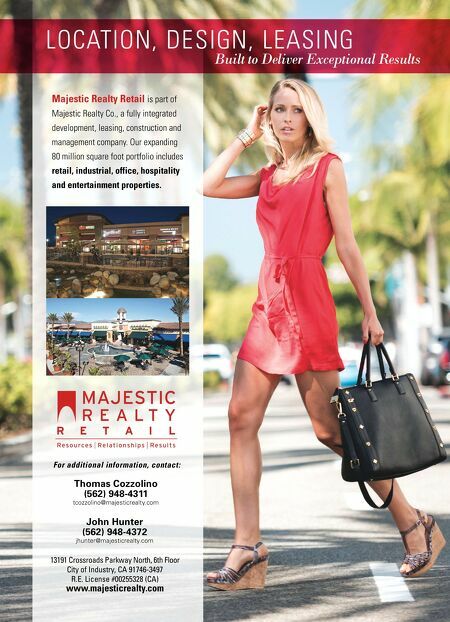 The Asian- themed retail center is 90 percent leased to tenants such as 99 Ranch Market, 85°C Bakery Café, Bambu, Bonchon, Candy Doll Beauty, MUMU Hot Pot, Sugar Dynasty, Poke Moana Restaurant, Pure Organic Nail Salon, Snowflake Dessert House, Lern Edu- cation, Brilliant Minds Academy and Pleasant Dental Care. UBS, in a joint venture with Blake Griggs, provid- ed equity capital for the project and Wells Fargo provided construction fi- nancing. FCGS Architecture designed the shopping center, and Deacon Con- struction was the general contractor. Vestar is managing the center. TERRELL, TEXAS REALTYLINK, OAKRIDGE UNDERWAY ON 190,000-SQUARE-FOOT CROSSROADS AT TERRELL IN TEXAS A partnership between RealtyLink and Oakridge Investments is underway on Crossroads at Terrell, a 190,000-square- foot retail development in Terrell, lo- cated 28 miles east of downtown Dal- las. The property will be anchored by a 74,000-square-foot Film Alley Movie Entertainment Center that is scheduled to open in 2019. New tenants including Hobby Lobby, Ross Dress for Less, Five Below, Chick-fil-A and Rack Room Shoes are scheduled to open at the development in spring 2019. Andrew Lehner of CBRE is marketing the property . Visit our Booth @ ICSC Western Division Conference Booth # 908 The Asian-themed Pacific Pearl Shopping Center in Pleasanton, California, is home to tenants such as 99 Ranch Market, Bambu, Bonchon, MUMU Hot Pot and Poke Moana.